Warm-up exercises should be an essential part of your routine before playing table tennis. 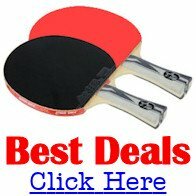 Table tennis is a fast physical sport which requires agility, speed and quick reactions. Therefore it's important that you perform warm-up and warm-down (cool-down) exercises prior to starting a session, and at the end of a session. Warming-up before you play reduces the risk of tearing or straining muscles, whilst cooling down will clear the system of the chemicals in the body (produced by the exercise) that can result in muscle stiffness. So let's take a closer look at the warm-up and a few exercises you can perform. To perform any of these exercises you should already have a reasonable level of fitness. If you are in any doubt about your fitness, you should first consult a medical expert for advice. The warm-up exercises and cool down period should last for approximately ten minutes, with five minutes of very light jogging and five minutes of stretching and flexibility exercises. You should wear an outer layer on top of your table tennis clothing, such as a track suit or waterproof suit, in order to keep you warm but it must not restrict your movements. You should start your warm-up with 2-3 minutes of light jogging. This will increase your core body temperature and heart rate and warm up the muscles and associated tissues. After 2-3 minutes of general jogging you should then move onto table tennis specific movements such as shuffle (side to side) footwork. You can see the shuffle (side to side) footwork in action in this video. After about 5 minutes of light jogging and shuffle (side to side) footwork, you then need to do some static stretching exercises. These exercises involve the major muscle groups used in table tennis and you should stretch them through their full range of movement. Hips and Groin - soles of feet touching and gently pushing down the knees. 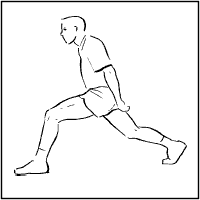 Hamstring - keeping the back straight, pull the leg towards the body keeping the leg straight. Trunk - bend to either side keeping hips stationary. Lower back - kneel with hands flat on floor. Lift right arm and left leg and extend horizontally (repeat with left arm and right leg). Arms and Shoulders - Hands together above the head, push the head forwards and the hands back with the arms straight. Arms and Shoulders - Hands on wall, push the shoulders downwards. Arms and Shoulders - Join the hands over one shoulder and pull. Arms and Shoulders - As above but using a towel. Arms and Shoulders - Hand on the opposite elbow and push backwards. After your jogging and stretching exercises you can also use imaginary stroke play and related movements (shadow play). By performing a range of different strokes you can warm up your muscles ready for your table tennis session. So go through a few repetitions of the forehand drive, backhand drive, forehand chop and backhand chop. You should ensure that you use your whole body as you do these strokes, so ensure that you bend your knees and twist your trunk.